Presiding Officer Norma L. Gonsalves recently invited the Girl Scout Troops of East Meadow to join her on a tour of the Theodore Roosevelt Executive and Legislative Building. The Girl Scouts were able to see first-hand the building which holds County Executive Edward Mangano’s office as well as the rest of the Nassau County Legislature. The girls also participated in a question and answer exercise on the legislative dais with Presiding Officer Gonsalves to learn more about the inner workings of County Government. 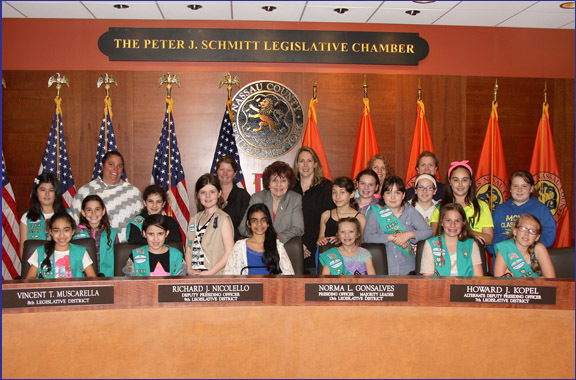 Pictured: Presiding Officer Gonsalves and members of Girl Scout Troops 1061, 1256 and 1316.